ID Keys: Large ear tufts, large size, yellow eyes, horizontal belly bars. The Great Horned Owl is the most widespread owl in North America, being found from the treeline near the Arctic south through the rest of the continent. Powerful predators, they will take prey larger and heavier than themselves. Great Horned Owls are among the earliest nesting birds, starting as early as mid- to late-winter. In general, Great Horned Owls prefer forested areas with adjacent open lands. However, they are incredibly adaptable and can be found in nearly any habitat in North America, from the treeline in far northern Canada and Alaska, to the deserts of the southwestern US and Mexico. Wide variety, with more mammals than other types of animals. Will eat rabbits and hares, rats, mice, ground squirrels, skunks, opossums, snakes, lizards, frogs, large insects, and birds up to the size of geese. They will take larger prey relative to their size than many birds of prey, even taking on porcupines and similarly sized prey. Primarily nocturnal, although they will occasionally hunt in the late evening or during the day (particularly during breeding season). Usually hunts by observing from a high perch and swooping down to capture prey once spotted. January through May in South Dakota, Great Horned Owls are one of the earliest nesting birds in the state, with pairs hanging around nesting sites for several weeks before they actually begin nesting and courting calls occurring throughout that period (as early as December in South Dakota!). They nest in a very wide array of locations, using repurposed nests of other species, cavities in trees or caves, or in abandoned buildings or other man-made structures. Stick nests from other species such as hawks or ravens may be augmented with additional material or not, while nests in cavities may be lined with softer materials such as down, fur, leaves, moss, or other vegetative material. The female lays between 1 and 5 eggs, and she does the majority of incubation. Incubation last 4 to 5 weeks. The young fledge from the nest about 6 weeks after hatching. Both the male and female have hooting calls that are given during an extended courtship period early in the breeding season (beginning as early as December). A wide variety of other vocalizations are sometimes given as alarm calls, contact calls, or communication around the nest. 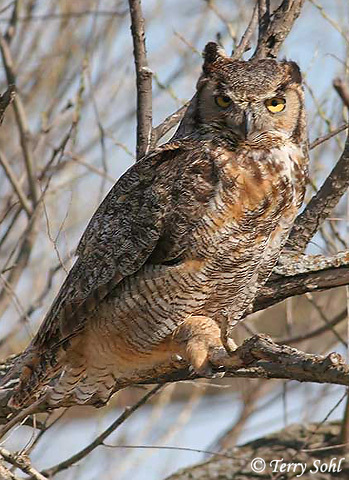 Click below to hear various calls of the Great Horned Owl. Permanent resident throughout its range, although individuals may wander widely. Widespread and common, with no apparent significant population declines (as noted by Breeding Bird Survey and Christmas Bird Count data). 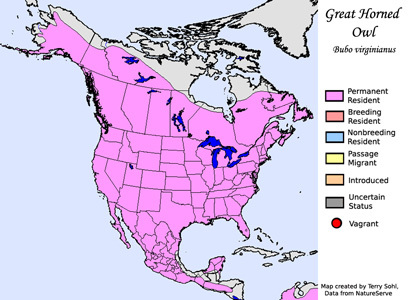 The IUCN considers the Great Horned Owl to be a species of "Least Concern". Click on the image chips or text links below for additional, higher-resolution Great Horned Owl photos. South Dakota Status: Common permanent resident throughout the state.